As the title suggests, Healy (it feels odd to refer to him this way, but I may as well stick to blog precedent) has selected the world of classic fairy tales as the setting for his debut. And he's found a clever twist that none of the other great fractured-fairy-tale authors, from Scieszka and Smith to Goldman to Sondheim and Lapine, ever hit upon, to my knowledge: telling the stories of the various anonymous princes lumped under the name "Charming." As the author explains, the bards who tell these tales tend to focus on the princesses and the witches and giants and such, and some of the facts—like the individual names and characteristics of the heroes involved, say—generally get lost. And so four princes as wildly different as Prince Frederick (Cinderella's prince, dashing and elegant but with no adventuring experience whatsoever), Prince Gustav (Rapunzel's, big and gruff and always ready to fight—and lose to—anyone or anything), Prince Liam (Sleeping Beauty's, a doer of deeds, and the only classic hero of the lot, really), and Prince Duncan (Snow White's, sweet but…a bit eccentric, let's say) all find themselves marginalized in their own stories under a single name that's not even theirs. Naturally, they're a bit resentful. They also find themselves not as happily-ever-after as the bard tales would have people think. Liam, for instance, discovers that when she's awake, Sleeping Beauty is a remarkably unpleasant princess, and not the sort of woman he wants to marry at all; for his part, Frederick finds that Cinderella, after her years of toil, wants an adventurous life and is terribly bored by the cushy, luxurious one he's accustomed to. Trying to solve their personal problems—and eventually noticing that the bards they each loathe so much have all mysteriously vanished—the four princes wind up meeting and joining forces. At which point they realize two things: First, with the exception of Liam, they are not the most competent of heroic teammates. Second, they're up against a much more fearsome foe than any of them had suspected, one who threatens all their kingdoms. Healy keeps the pace quick and the tone wonderfully light throughout—if you imagine a combination of The Princess Bride and The Hitchhiker's Guide to the Galaxy, you'll have a sense of how funny this book is. He also proves expert at sharp characterization, from the four princes themselves to ingenious supporting characters like a bratty ten-year-old boy who's so evil and so devious that he's become the Bandit King and now runs the whole region's criminal element; a benign and pleasant giant who, unfortunately, has to work for an evil witch because he needs the job; and the land's best bounty hunter, who also happens to have a severe case of clinical depression. The result is a true page-turner of an adventure story that also has its readers—young and old, but especially young—constantly in stitches. When I was reading the book to my seven-year-old at bedtime, I had to take lengthy pauses many times to allow Dash to recover from paroxysms of laughter. At the same time, he was always pushing to read more chapters than we had time for in a given evening, eager to find out what happened next. Frankly, if I'd known he was going to be this good at this back when I was editing his section at Cookie magazine, I'd have encouraged Chris to miss a few deadlines and start writing his book sooner! I suspect this is the beginning of a long and ever more fruitful career for him, and as with all the other leading lights of the genre, I can't wait to see what he comes up with next. 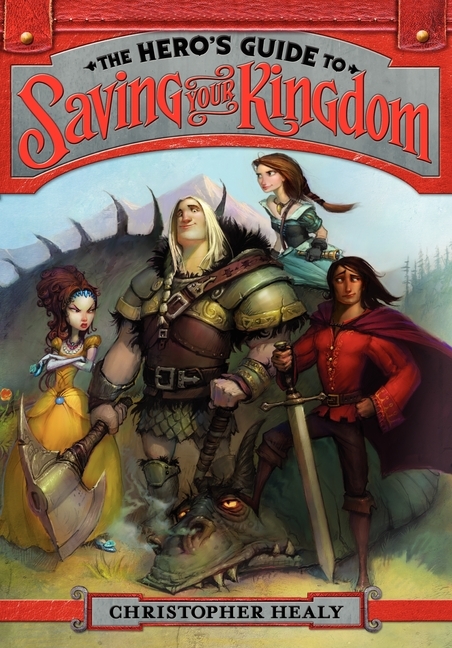 I also, of course, couldn't be more pleased to give The Hero's Guide to Saving Your Kingdom my highest recommendation. How wonderful--interesting princes for, of course, all those sintilating princesses. Glad to have stumbled on this site for all those grandchildren out there.